All NPII HIX dryers feature the new sleek low profile design and side mount control panel features includes an analog variable belt speed controller, thermostat controlled temperature, digital heat controller, and a variable air speed controller. Double-wall insulation on top and sidewalls utilizes a 2" thick high temp ceramic insulation for optimum energy efficiency. The NPII 1806 Electric oven is a great starter unit for any shop that specializes in small production runs and custom orders. The NPII series dryer design offers the most efficient drying technology available. This newly designed low profile model is extremely efficient due to its’ thermal lock insulation and variable speed recirculation system which allows for 97% recycled air. This model features analog variable belt speed and air speed control which synchronize with the digital thermostat to give you total control when dealing with a variety of substrates and inks. The NPII 2410 is a great dryer for small to mid-size shops. This type dryer is ideal for drying water based textile inks, as well as traditional plastisol and solvent- based evaporative inks. 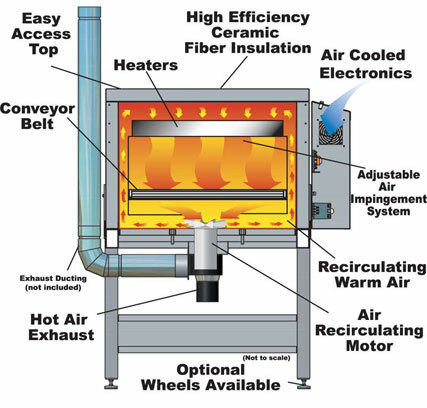 The NPII features a unique combination of infrared and forced air drying technology. Innovatively designed heat flow and exhaust configuration give the operator dynamic control over all heat chamber conditions. The sleek low profile design and side mount control panel features allow for easy maintenance and accessibility to parts. The HIX NPII-3616 is a high production dryer featuring bottom air recovery and re-circulating air knives throughout the drying chamber. Perfect for your direct-to-garment operations the 3616 eliminates the need for more expensive gas conveyor dryers. This multi-purpose dryer can handle water-based textile inks, as well as traditional plastisol and solvent-based evaporative inks. Utilizing a unique combination of infrared and forced air drying technology the 3616 delivers an astounding 58,251 BTU’s of drying capacity!